In ancient Israel it was not unusual for women to work outside the home, young women at least. When a girl was eight to ten years old, she began leading the family herd out to nearby pasture. 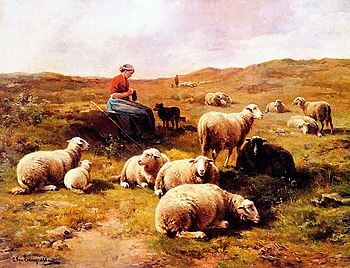 At the end of the day, the shepherdess brought her sheep back home. At night the animals were “housed in stone-walled pens attached to buildings or compounds, or on the ground floor of houses in the cities,” or corralled in thorny, fence-like enclosures typical of nomadic enclosures. Tending the family herd was reserved primarily for girls, and they continued this work until married at age fifteen or sixteen. As a young shepherdess, Rachel met Jacob when she came to water her sheep (Genesis 29:9). 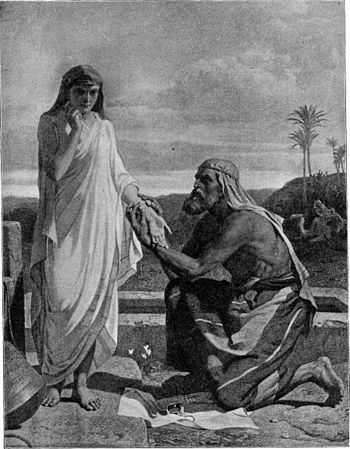 Moses’s wife Zipporah was one of seven daughters who tended their father’s sheep (Exodus 2:16-21). 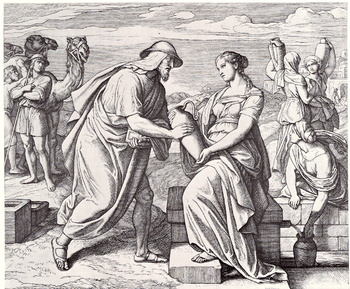 Some scholars speculate that Rebekah and Leah were also shepherdesses. In Solomon’s ancient love poem, he refers to the Shulamite as being dark skinned from a life outdoors, tending the vineyard and caring for her flock of goats (Song of Solomon 1:5-8). Besides pasturing the flocks, watering and watching them, tending minor injuries and sheltering them at night, a shepherdess also had the womanly duty of spinning. Equipped with her drop spindle and a bundle of wool, she could spin yarn during her hours in the field. In times when local grass was insufficient, men took the herds further afield. Abraham, Lot and Isaac moved about with very large herds. Commenting on the size of nomadic herds, Borowski states, “Herds can be very large, from 150,000 to 200,000 animals, and they are comprised of one species or are mixed.” The young nomadic women worked close to home. After working fourteen years for Laban as a sheepherder, Jacob established his own home and engaged in semi-nomadic herding. When necessary he moved his sheep away from home base to distant fields, camping out until bad weather brought herds and shepherds home. Technically a shepherd is different than a sheepherder, although they share some of the same duties. Rachel was a shepherdess before she married Jacob who became a sheepherder. Jacob managed large flocks that belonged to others along with his own animals. He had the knowledge and experience to build and handle herds numbering many thousands of animals. A sheepherder decided when to move the herds and found suitable grazing. He determined which animals to slaughter and sell. He strengthened the herd through careful breeding. He treated animal diseases, located lost sheep, and protected the flocks from wolves, hyenas, lions and bears. He disciplined subordinate shepherds and dealt with thieves. Clearly the work of a shepherdess, though less extensive than that of a sheepherder, was important. It prepared her for marriage and independence from her family. It developed her sense of purpose and responsibility. It built her strength and health. It instilled the appreciation for quiet companionship… the sheepy kind, at least. However, Bible accounts indicate the lives of some shepherdesses also had a few downsides—mostly involving men. Now the priest of Midian had seven daughters. And they came and drew water, and they filled the troughs to water their father’s flock. Then the shepherds came and drove them away, but Moses stood up and helped them, and watered their flock (Exodus 2:16-17). I wonder how often Jethro’s daughters endured the scenario of laboriously filling the watering troughs from the well, pitcher-full by pitcher-full, only to have their flocks pushed aside by surly shepherds, too lazy to draw their own water. It must have been often because Jethro asked them why they were back home so soon. An Egyptian delivered us from the hand of the shepherds, and he also drew enough water for us and watered the flock (Exodus 2:18-19). 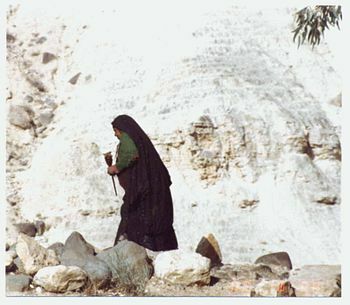 Access to water was a source of contention (Genesis 26:12-33). Because of the scarcity of water, communal wells were often protected. When Jacob met Rachel at the well, he questioned why all the sheep were laying around rather than being watered. Rachel pointed to the great stone that covered the well. We cannot [water the sheep] until all the flocks are gathered together, and they have rolled the stone from the well’s mouth, then we water the sheep…[so] Jacob went near and rolled the stone from the well’s mouth, and watered the flock of Laban his mother’s brother (Genesis 29:8-10). Regular or occasional unmannerly treatment of young women at the wells, and the heavy stone barricades sealing off some of the water sources certainly presented major difficulties for the shepherdess. Oded Borowski, Every Living Thing (1998), p. 45. Her fat-tailed Awassi sheep were raised primarily for milk and meat. These hardy sheep were good grazers, but the quality of their wool is inferior by today’s standard. Awassi sheep are double-coated with only a thin layer of fleece under an outer coat of coarse hair. The wool of double-coated sheep is known as “carpet wool” in contrast to the fine wool of Merino sheep used in today’s expensive clothing. Happily, Rebekah, Rachel, Leah, Zipporah and other ladies who spun the Awassi fleece had nothing to compare it with. Their wool well spun and woven was fine wool. Posted in Awassi sheep, Bible women, Jacob, Jethro's daughters, Occupations of Bible women, Rachel, Rebekah, Sheep, Sheepherder, Shepherdess, Shepherds, Spindle, Uncategorized. Bookmark the permalink.